*This entry is part of a "Blogathon" to benefit the flood damaged Louisville, KY Free Public Library. See the link below to donate to this effort. The main title of this piece was chosen by the organizer of the blogathon. The subtitle is mine--all mine. You'll forgive me if I don't wax poetic on the mandated title and theme. The idea that libraries "rock" or are "awesome" or even (another variant suggested by said organizer) "kick a**" reminds me of the lame, costly, and inevitably unsuccessful marketing campaigns that public library P.R. departments love to launch in a vain attempt to up the cool factor. The public library can do without a groovy, hip, or cutting edge image. Customers already know what the library has to offer. Non-users won't be sold on its services by slick advertising--or what passes for it in those pathetic public service announcements. Teenagers tell each other they can stay online all afternoon at the library, catching up with pals on Facebook. Job-hunters use the same computers to apply for positions, update resumes, and check for new listings. Mothers bring in preschoolers and check out a dozen picture books. Book club members are happy to find a copy of James McBride's The Color of Water for next week's meeting. There isn't anything flashy or glitzy about these transactions, but that doesn't mean they aren't important. Without the library, all of these people would be out some serious dough. Buying computer time and books adds up fast, and superfluous scratch is in short supply these days. Nobody cares if libraries "rock." The public library gives people what they want, and doesn't pass judgment. A young woman wanting to know how long marijuana can be detected in urine--a real reference question I answered--is treated with the same respect as the student writing a paper on Macbeth. A good librarian never asks why anyone wants to know anything. That's not our department. Our business is providing the information asked for, no ifs, ands, or buts. For free. On demand. In person. By phone. By e-mail. No strings. No exceptions. No B.S. That doesn't "rock," but where else can you get it? I'm a subversive librarian, here to help a submerged library. The public library must not be allowed to drown in real flood waters or in a sea of red ink. 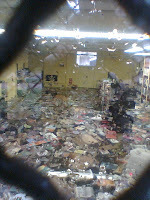 Here's the link if you want to help out the water damaged Louisville Free Public Library. If you want to help out your own local library--likely neck deep in that red ink--ask the librarian how you can assist with the bailout. It ain't glamorous, it doesn't "rock," but it is vital. Plus they provide the have-nots a mean to access the Internet.